Since the beginning of public education in the United States, its purpose has been to prepare our learners for the world of work and society in which they live. Educational systems, including the learning environment and learning experiences, have been designed to achieve that purpose, identifying who the learners are and what skills they need. 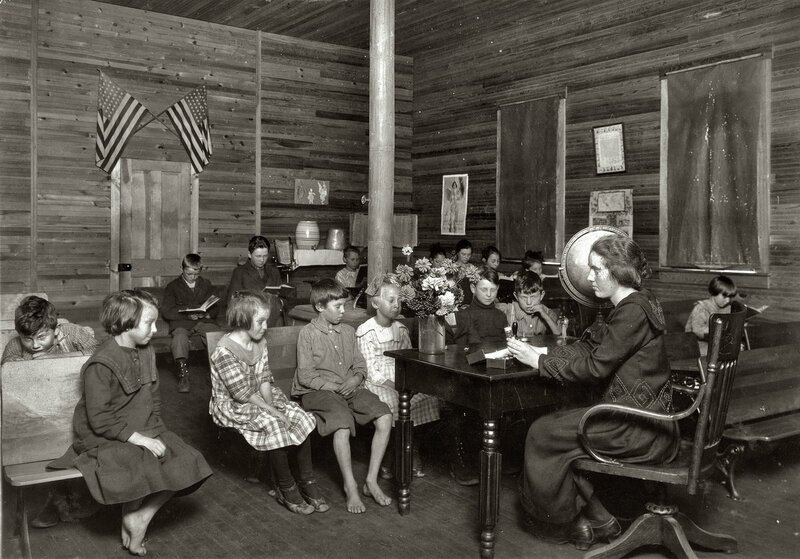 For instance, the traditional one-room school prepared young learners with basic reading, writing, and math skills to be successful in an agrarian society, in which small groups of mixed ages of people worked together, assisting each other to accomplish their tasks. The structure of that classroom, where small groups of learners worked together to complete individual and group tasks, achieved the purpose of mirroring the probable future work life for students for that specific era. As society and the work world transformed during the Industrial Revolution, the educational system also transformed to a factory-style learning environment, with every individual learner engaged in routine tasks at the same time. By doing so, schools were preparing their learners to be successful in an industrial work environment, mass producing and repeating routine tasks. Again, the educational system and classroom experience were a parallel for the work for that particular time period. These educational systems are often referred to as Education 1.0 and Education 2.0. We ask ourselves what Education 3.0 entails, and what is the society and world of work world for which are we preparing our learners in this age? Our design of education 3.0 must focus on how we prepare learners for a world that changes so rapidly that it may change repeatedly in their 12 to 13 years in school. To fully address this, we must ask several questions. Daniel Pink’s, A Whole New Mind, further discusses in his presentation on Global Leadership Development that the skills addressed in education that traditionally led to success in the 20th century are not sufficient in and of themselves to prepare learners for reaching and surpassing their highest hopes, realizing success or achieving satisfaction in today’s society. Pink asks why those skills are no longer sufficient and why other skills are necessary in the ideal profile of a learner. He identifies economic and technological changes to explain the consequence that routine work, defined by steps and one right answer, takes fewer people to accomplish and is decreasing in the work landscape of US businesses. He provides six specific right-brain abilities that companies and organizations are looking for in our current age of innovation: design – designing products that are not simply for utility but significance; story – using background and context to add significance and sell products; symphony – seeing the big picture and patterns to formulate new ideas and design; empathy – something which cannot be automated; play – enjoyment; and meaning – seeking meaning in the work we do and the life we live (2017). Because we see the evidence of society and the world of work transforming, we must rethink the way we develop students we need to be developing for any opportunity and challenge in our global society. In such a time of change and innovation, it is essential for educational communities to identify those skills that learners need to develop. Tony Wagner lists the “Seven Survival Skills” as critical thinking and problem-solving, collaboration across networks and leading by influence, adaptability and agility, initiative and entrepreneurship, effective oral and written communication, accessing and analyzing information, and curiosity and imagination (2018). In an effort to identify the skills business leaders, companies, and organizations are looking for as they hire employees, Forbes Agency Council shared its findings in Forbes magazine, published September 2018, on 13 Underrated Skills that Agencies Look for in New Hires. Those skills include creative problem solving, emotional intelligence, hustle mindset, deep thinker, perseverance, general curiosity, person-to-person communication, empathy, humility, ability & willingness to learn (adaptability), goal striver, grit, and intellectual curiosity. There are several other thought leaders who have outlined sets of these skills and those are detailed in another white paper: Life Ready is Future Proof. How do we, in education, prepare our learners with such skills? At engage2learn, we assist school districts in creating a Learner Profile to identify the characteristics and skills learners need to thrive in a rapidly changing global society. If possessing those skills is the end in mind, beginning with a Learner Profile that is interwoven into learning experiences is the answer. If Education 3.0 must prepare learners for innovation and design, and Learner Profiles are a starting point for educational communities, what exactly is a Learner Profile and how does a local school district create their own profile of a learner? If districts have a set of academic accomplishments, credits and skills they expect learners to graduate with after their senior year, is that sufficient? The answer is no; that is a graduate profile. Truly growing learners in the skills discussed by business and education thought leaders requires learning experiences immersed in those skills for every learner, every grade, every day. Partnering with engage2Learn, school districts are able to identify the traits, characteristics and skills that are necessary for learners to engage in daily; therefore, they are written in present tense for learners rather than future tense for graduates. This Learner Profile sets expectations for students and staff for what learners need to be doing daily. We facilitate the design of the Learner Profile with a team of stakeholders representing a microcosm of the educational community, which helps a district identify the ideal profile of learners in the context of the community and larger society in which they live. Beginning with who the learners are and what they need to thrive helps educators design learning experiences that will ensure the learners acquire skills the community values. We have a Learner Profile – Now what? Before the learning framework design process, our learners were achieving at a high level because Frenship has eager learners and highly skilled, dedicated teachers. Yet, as a fast-growing district, we found ourselves struggling a bit to find a district-wide, shared focus or clarity around our beliefs about learning. In addition we grappled with identifying a cohesive, sustainable method of translating our beliefs into actions. Now, we have a common lens through which to identify excellence in teaching and learning. Our teachers, utilizing our learning framework aligned to our Learner Profile are designers of engaging, rigorous, and relevant lessons so that all learners are better equipped for the endless opportunities the future holds. Many other district partners have partnered with engage2learn to design the learner profile and the actionable learning framework aligned to the profile. For example, South San Antonio Independent School District, also took actionable steps to align their teaching and learning process to their beliefs and Learner Profile. Amy Shields, Director of Teaching and Learning in SSAISD, describes the Learner Profile as one of the key pieces in a strategic design process: “Bringing all stakeholders together to align and come to agreement on our vision, beliefs, and learner profile to drive their goals and the impetus for the learner framework….The learner framework is specific and provides teachers with research-based best practices to implement to help students attain the characteristics on the learner profile.” These partner districts, along with many others, began their process with the learners in mind, going through intentional design, to discover their beliefs to design a Learner Profile that serves as the springboard for actions, transforming to the third generation of education for all learners. In the chart below, Keats & Schmidt describe characteristics of Education 3.0 in higher education; however, as an organization, we, at engage2learn, realize that learners cannot wait until they reach higher education to develop the skills they need for their future. Focusing on a Learner Profile to drive teaching and learning decisions prepares every learner for any future choice. As we often say at engage2learn, life ready is future proof. Bonk, C. J., & Reynolds, T. H. (1997). Learner-centered web instruction for higher-order thinking, teamwork, and apprenticeship. In B. H. Khan (Ed. ), Web-based instruction (pp. 167-178). Englewood Cliffs, NJ: Educational Technology Publications. Dias, S. B., & Diniz, J. A. (2014). Towards an enhanced learning management system for blended learning in higher education incorporating distinct learners’ profiles. Journal of Educational Technology & Society, 17(1), 307–319. Griffin, Patrick. (2014). The changing nature of education, schools and employment readiness. The University of Melbourne: Melbourne, Australia.